I have been a remote video camera junkie since AXIS came out with their first IP enabled cameras back in the late 1990s. Leveraging an ISDN internet connection, I was able to monitor my house and a vacation property remotely from a computer. Smartphones didn’t exist at that point, so you had to hunt down a computer and a modem or other connection. The video quality of these cameras was, to say the least, quite low. If I remember correctly, that first camera had 120×120 pixels resolution, which is not really enough for anything serious. Flash forward to now, and we have a ton of different options. 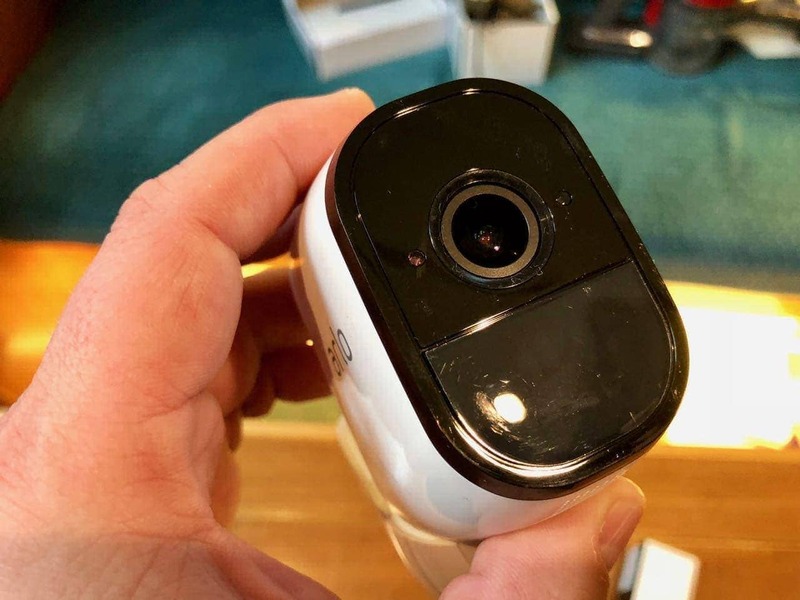 I have tried cameras from Nest/Dropcam, Mobotix, Arlo, Ubiquiti, AXIS, Sony, and probably 10 other lesser known manufacturers that I’ve forgotten. So many have restrictions, or are lacking key features, or simply have terrible video quality. 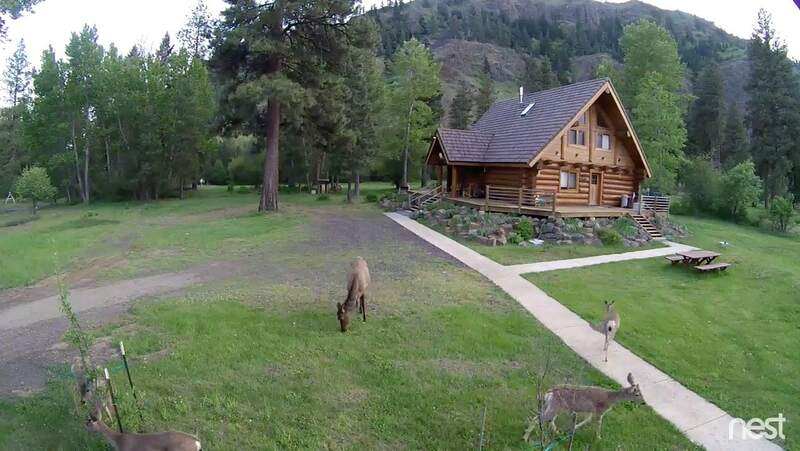 For the family cabin, we currently use Nest cameras, which have been in place for a number of years. We started when they were called Dropcam, and in 2011 put several inside the house looking outside. This didn’t work as well as I would have liked due to the reflections, as well as family members unplugging them and forgetting to plug them back in. I built and also bought some outdoor cases for the cameras, and they ran for 2-3 years in extreme temperatures outside ranging from over 100F to below 0F and blowing snow and ice. A year or so ago they were upgraded to the outdoor Nest cameras. 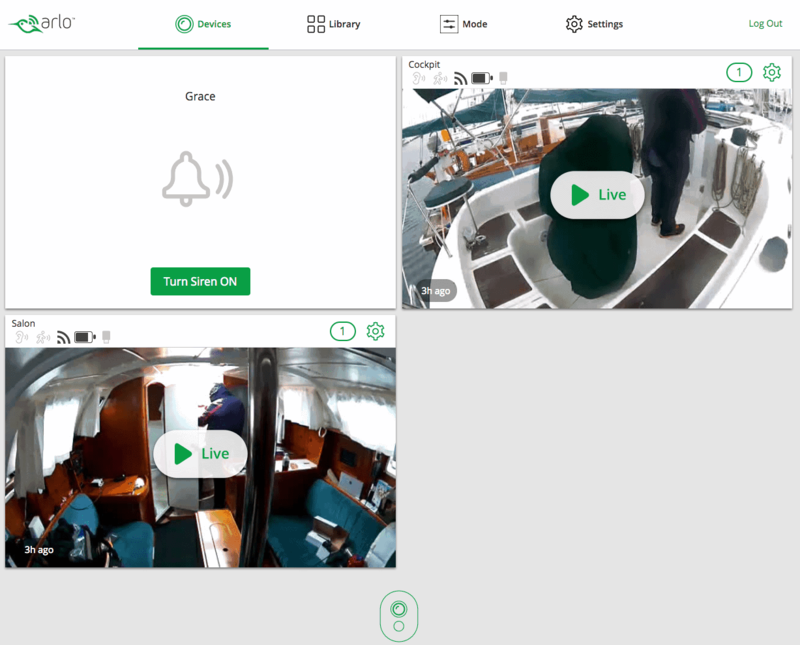 While doing this, I looked at adding cameras to the sailboat, and took advice from a friend who had just invested in Arlo cameras for his house. 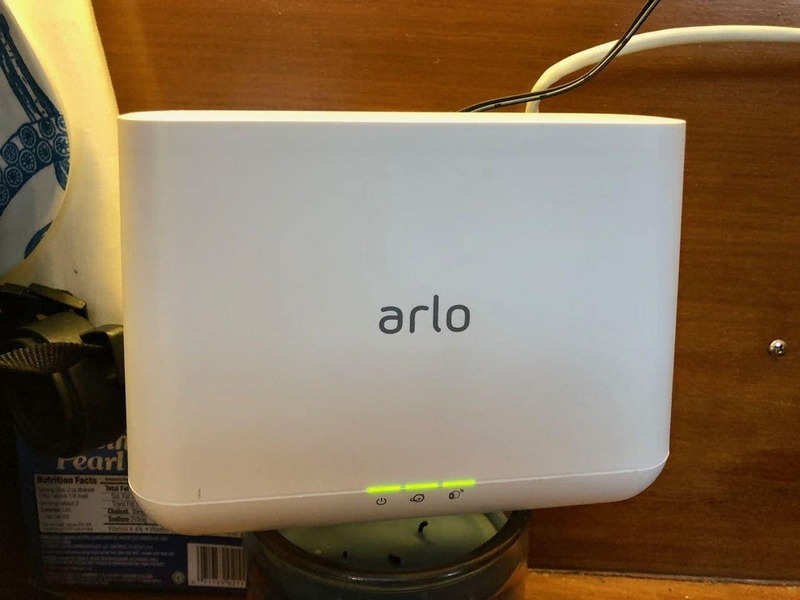 Arlo and Nest differ in a couple of ways – Nest is on all the time, and takes between 200Kbps-400Kbps of bandwidth constantly. 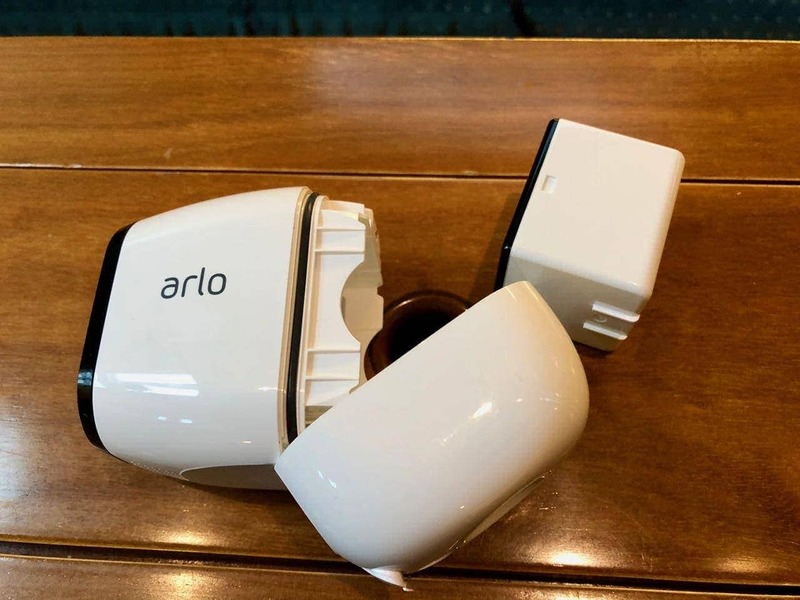 Arlo only streams video up to the cloud when there is motion, or when you command it to do so. Nest requires an AC power source, while Arlo are battery powered. I could overcome having to provide constant power to Nest cameras on the boat, but the upload bandwidth required is what would kill me. At 200Kbps minimum per camera (usually much higher for HD), I would blow through my LTE data allowance in only a few days! And the video quality on the lowest settings is not that great, so you could be looking at nearly half a megabit per second for a single camera. 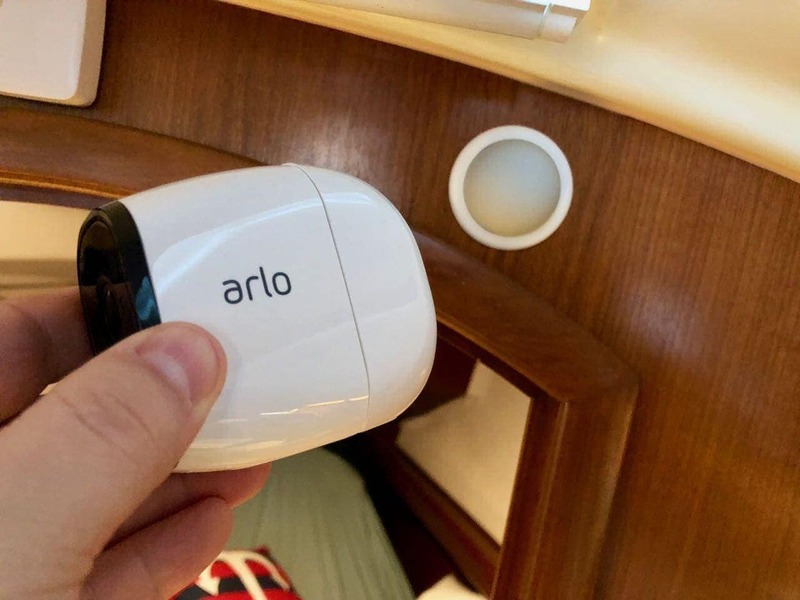 Note that Arlo can use a similar amount of bandwidth when you are looking at a live stream, or when it is sending video to the cloud after detecting motion. However, this bandwidth is only used on demand when those things are happening, not all the time like Nest or other cameras. After doing some testing with a friends Arlo system, and looking at reviews and other resources online, I took the plunge. 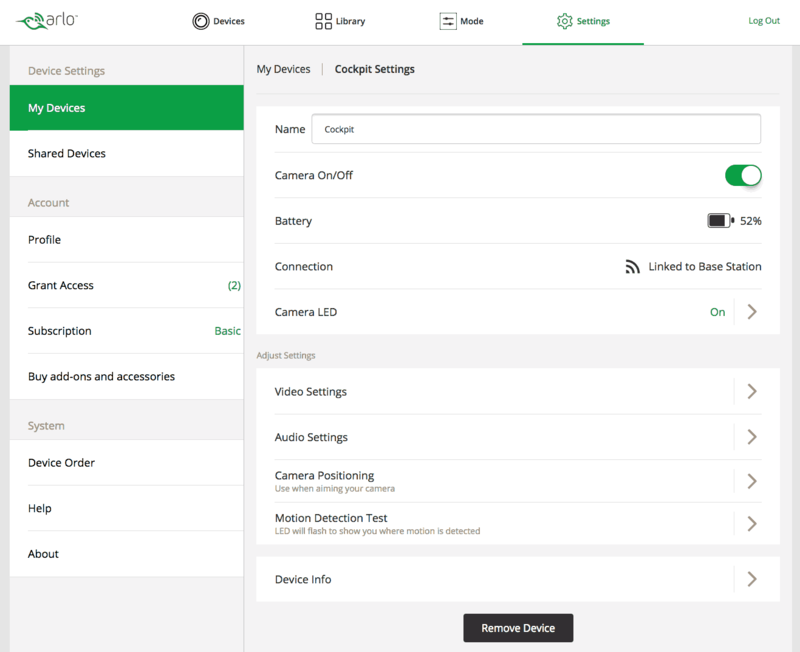 I ordered the Arlo Pro bundle which included a base station and one camera, and added a second camera. At the time I couldn’t order a single base station with two cameras, but it looks like you can now. The base station is bigger than I would like for a sailboat and limited storage, but not overly huge. It has some nice status lights to tell you things are working, and a button on the top to sync a new camera, or silence the alarm. 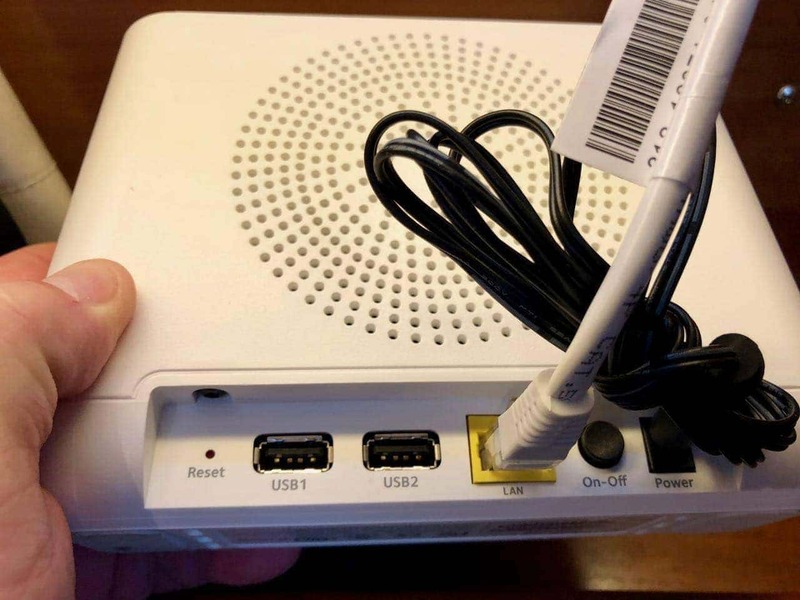 The back has a reset pinhole, a couple of USB ports which apparently are for “future use”, the ethernet to connect to your internet source, an on/off button, and power connector. I will be using the cameras only while on dock power at a marina, and usually stow the whole thing while underway or on anchor. The cameras are well built and easy to pair with the base station. This one is mounted in the salon and looks back towards the cockpit doors. The standard mounts are pretty slick – the grey circular part is metallic, and the camera has a strong magnet and indentation on the back. This makes for some very easy adjustments and angles without fiddly screws or other methods. The mount itself takes a single screw to attach to the wall. There are also a ton of Arlo mounts, as well as 3rd party cases, mounts, sun shades, and other solutions. The camera itself has a very wide 130 degree angle of view and works both in daylight and night. Out of all of the cameras I have tested, this one has the best night vision. The back of the camera hinges open to reveal a pretty bulky square battery which can be recharged with the provided cable and power brick, or while in the camera using the door on the bottom rear. Beware – do not do what I did and assume that the USB power brick is just like all of the other bazillions that you get with cameras, phones, and everything else nowadays. These are higher power, which is required to charge the Arlo batteries. A normal USB charger, or even a high wattage one will not work. In the cockpit I used a stainless steel hose clamp to mount the round mounting piece on one of the bimini poles. The camera snaps right on it easily. With the great field of view, I can see the whole cockpit, cockpit doors, most of the center area of the boat, and the walkway leading up to the boat as well. I’ve had the outside camera exposed to both the heat of the summer, and the wet windy fall, with a few winter days thrown in. So far it has had zero issues. Battery life is dictated by how many times they go off due to motion or alarms, and how many times I connect in and watch things when I want to see what is going on. So far I have only charged them once, and that was after a lot of usage. The magnetic mounting is perfect in the cockpit – if we’re ready to head out on a trip, we just grab it off the mounting, stick it below, grab the one in the salon as well just so everyone feels more comfortable that no one is watching us, and off we go! 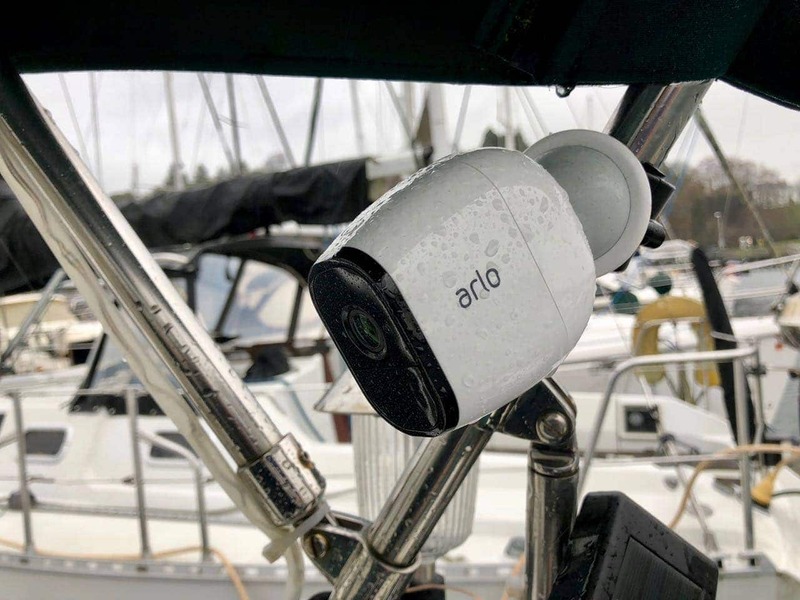 Arlo is a cloud based video service, so the videos and images are not stored on the base station or the cameras. It requires an internet connection, and they are sent to your account online. You get 7 days of history and 5 cameras for free, and you can upgrade for more history, more cameras, and analytics features. I use the free version. The interface gives you a view of your cameras as well as the ability to control the base station alarm, which is extremely loud! You can be alerted by push notifications to your phone or emails. Any notifications will show up on the camera page, and in the Library. Here you can see some videos that were captured based on movement (me arriving at the boat) and stored in the library. You can set different modes which controls what happens to the cameras when they see motion, hear noise, etc. The defaults are pretty straight forwards, but you can also configure pretty granular scenarios and adjust the sensitivity, fire off the siren alarm, and more. The cameras themselves have a decent amount of options, although I have had AXIS and Mobotix cameras with far more control. However, this should suffice for most use cases. 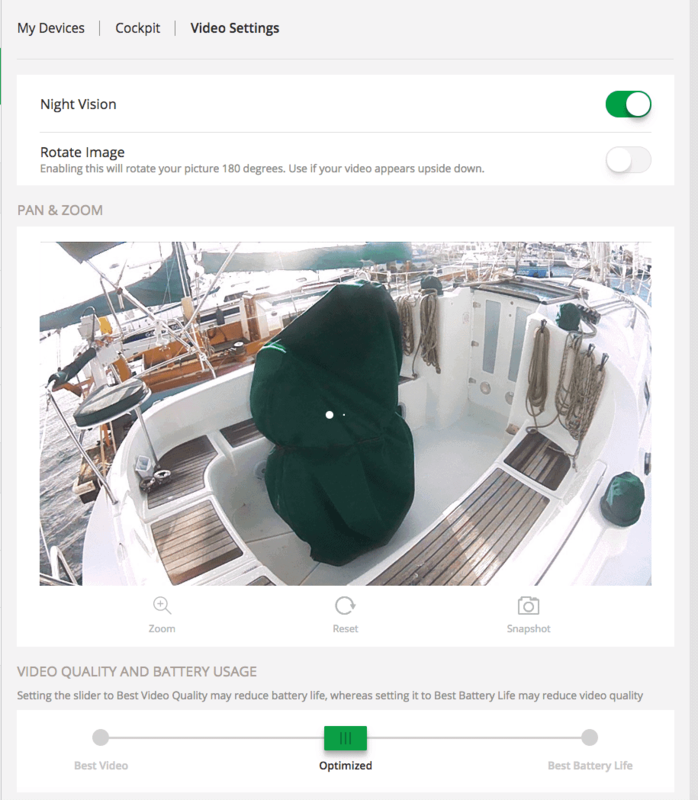 You can pop up a test screen that is live while you install things, and override the automatic settings for video quality (will burn more battery if you increase it) and adjust Night Vision and such. Arlo’s mobile app is what I use more than the website to quickly check on things, and deal with any alerts. It loads fast, works well on both Android and iOS, and has all of the features from the website. One common thing I do with the app is to look at historical clips, and also change the mode when I am leaving/arriving so I don’t set off alarms and the cameras. 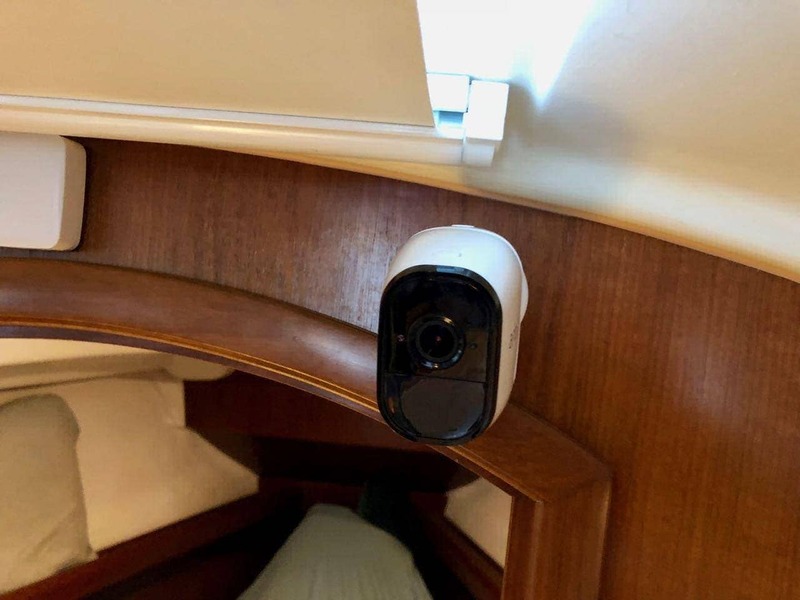 One thing to note is that these cameras saved me from a problem boat neighbor. In fact, I moved slips because the cameras showed me what was going on. 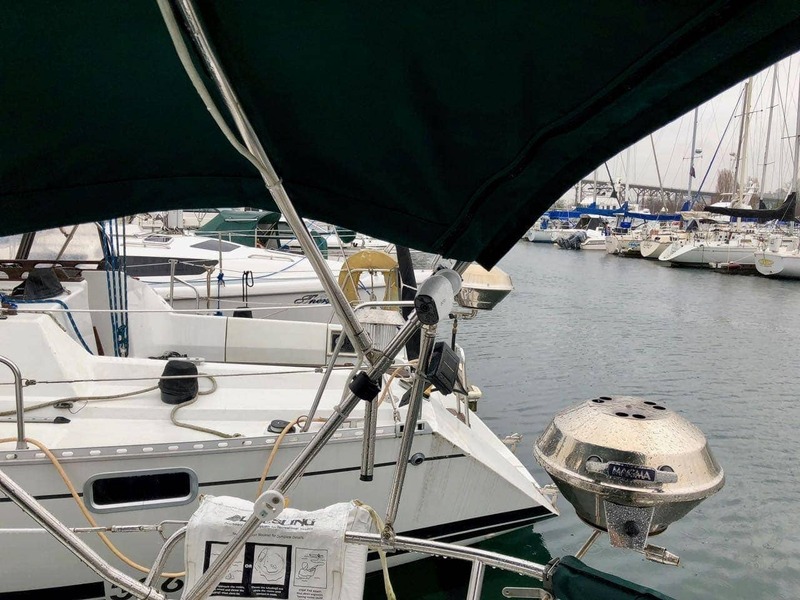 Essentially, a brand new sailboat neighbor took over a vacated slip next to Grace, and began living on their boat with 3-5 additional people. This was a small 25-28′ boat and definitely did not have room for that many people. Our marina strictly controls liveaboards as well, and these folks weren’t part of that group. They treated the finger pier in between us like their personal garbage dump, making it almost impossible to get to my boat. They also had bikes, skateboards, and other things that I saw several times roll off and hit my boat. After multiple complaints to my marina, and showing them the videos, I moved, and they talked with the owners. I haven’t seen them on their boat since. Above you can see an example video of when we recently had 35 knot winds and nasty waves and rain coming through Seattle. The video is pretty clear, and I can see if things are loose in the cockpit and other general areas. If you hop into the website or app, you can trigger live view, and also record it, which is what I did here. Here’s me arriving in the cockpit, and the motion sensor going off to catch me. Here I am making my way into the salon during the same arrival, and turning off the cameras. Night vision is pretty impressive with the Arlo cameras. Many others that I have tested have had very poor distance and quality when using infrared or other technologies. Here you can see the cockpit on a rainy dark night. Being able to check the interior at night is always nice as well. Every once in a while I catch a visitor in the cockpit. Overall, I am very pleased with the cameras. The quality of the video is great for my needs, the battery life very respectable (3-6 months depending on usage), and mounting/unmounting when underway is easy and quick. They don’t take up tons of bandwidth, and give me peace of mind – I can flip them on whenever I want, from wherever, and they are watching for any suspicious activity, day or night. I would definitely recommend them for anyone looking for security cameras on a boat or anywhere else for that matter.